Beauty Products for 50% Off! Art Naturals offers Free Shipping on purchases of $20 or more. Carol’s Daughter offers Free Shipping on purchases of $40 or more. Carol’s Daughter shipping costs start at $6.95 for smaller orders. Carol’s Daughter offers Free Shipping for Friends of the Family ($25 annual fee) members. clariSEA offers Free Shipping on purchases of $35 or more. Coloured Raine offers Free Shipping on purchases of $100 or more. COSMEDIX offers Free Shipping on purchases of $75 or more. Kneipp offers Free Shipping on purchases of $50 or more. Kneipp® currently does not ship to Alaska, Hawaii, The Bahamas or California. Korres offers Free Shipping on purchases of $50 or more. Marcelle offers Free Shipping on purchases of $75 or more. Some products available for 10% discount when buying 3+. PCA Skin offers Free Shipping on purchases of $100 or more. SkinStore.com offers Free Shipping on purchases of $49 or more. Today’s new offers include a “spot sale” at Mirenesse on a MakeupBonuses Favorite! The Mirenesse Mattfinity Matte Lip Rouge Mousse is a dreamy formula that is lightweight, hydrating, full of pigment, and comes with a uniquely shaped applicator that makes application easier than usual. See below for more details. AMOREPACIFIC offers Free Shipping on all purchases. Beauty Care Choices offers Free Shipping on purchases of $49 or more. Boscia offers Free Shipping on purchases of $50 or more. Brilliance New York offers Free Shipping on purchases of $100 or more. La Mer offers Free Shipping on all purchases. La Mer offers Free Returns on all purchases. Lord & Taylor offers Free Shipping on purchases of $99 or more. Lord & Taylor offers Free Shipping on Beauty purchases of $49 or more. Lord & Taylor offers ShopRunner 2-day Shipping on select items for ShopRunner members. Lord & Taylor offers Free Returns for ShopRunner members.Lord & Taylor offers price matching – contact customer service to initiate (https://fave.co/2LEft5k). Lord & Taylor offers price adjustments on items permanently marked down (request within 7 days of original purchase). Paula’s Choice offers Free Shipping on all purchases. Free shipping for the rest of the 2018 season! SebaMed offers Free Shipping on purchases of $35 or more. Sisley Paris offers Free Shipping on all purchases. The Seaweed Bath Co offers Free Shipping on purchases of $25 or more. Beauty Break – 4 hours only! Combines with the 50% off offers!! 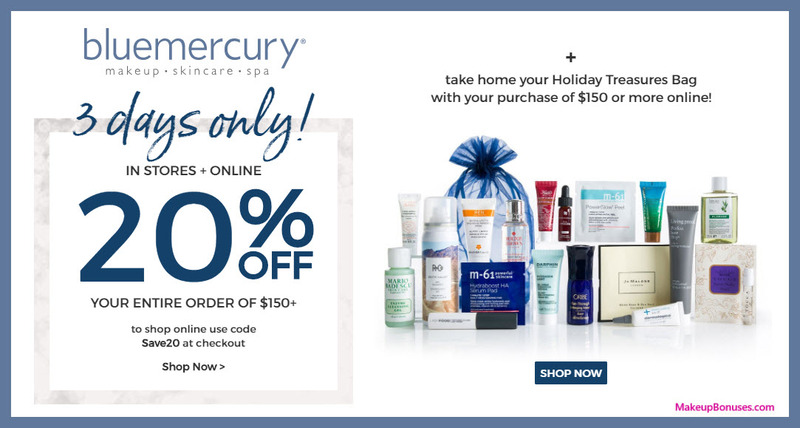 New Beauty Offers Include Lots of Holiday Closeouts! Hello to the last weekend of 2018! There are more great year-end offers today, including FREE OVERNIGHT SHIPPING from Bobbi Brown (order by 3pm) so that you can have your beauty products in time for your New Year’s Eve soirees! Cake Beauty offers Free Shipping on purchases of $50 or more. Cake Beauty offers Free Returns on all purchases. Cult Beauty offers Free Shipping on purchases of $52 or more. Derma E offers Free Shipping on purchases of $25 or more. Doucce offers Free Shipping on all purchases. Eyeko offers Free Shipping on all purchases. Malin+Goetz offers Free Shipping on purchases of $75 or more. Mica Beauty Cosmetics offers Free Shipping on purchases of $100 or more. Michaels offers Free Shipping on purchases of $49 or more. Morphe Brushes offers Free Shipping on purchases of $60 or more. Murad offers Free Shipping on purchases of $50 or more. Free shipping on all orders until 12/31/2018. Sedu offers Free Shipping on purchases of $50 or more. SOKO GLAM offers Free Shipping on purchases of $35 or more. Theorie offers Free Shipping on purchases of $50 or more. Boxing Day and Post Christmas Beauty Offers Galore! Today’s new offers include deals from over 110 stores! Celebrate Boxing Day or spend your Christmas gift cards and get great deals on it all!! 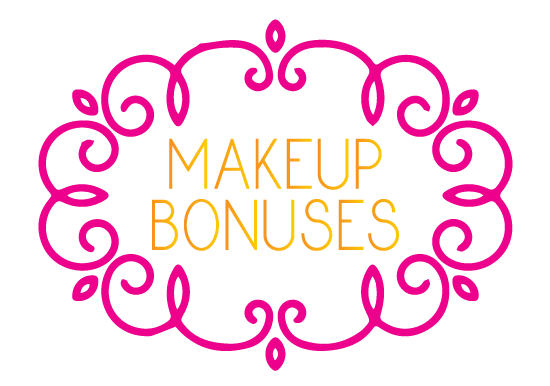 Be sure to take note of some of the best offers noted with the MakeupBonuses #BoldOffer tag. Anastasia Beverly Hills offers Free Shipping on purchases of $25 or more. bareMinerals offers Free Shipping on purchases of $50 or more. bareMinerals offers Free Shipping for foundation orders. BeautifiedYou offers Free Shipping on purchases of $25 or more. Beauty Bay offers Free Shipping on purchases of $20 or more. BeautyStoreDepot.com offers Free Shipping on all purchases. to qualify for free shipping with no beauty purchase. Benefit Cosmetics offers Free Shipping on purchases of $50 or more. Billion Dollar Brows offers Free Shipping on purchases of $30 or more. Biotherm offers Free Shipping on purchases of $50 or more. Borghese offers Free Shipping on all purchases. Cargo Cosmetics offers Free Shipping on all purchases. Caswell-Massey offers Free Shipping on purchases of $100 or more. Catrice offers Free Shipping on purchases of $25 or more. Clarins offers Free Shipping on purchases of $75 or more. Clarins offers Free Shipping for Passport to Beauty (Ambassador Level) members. 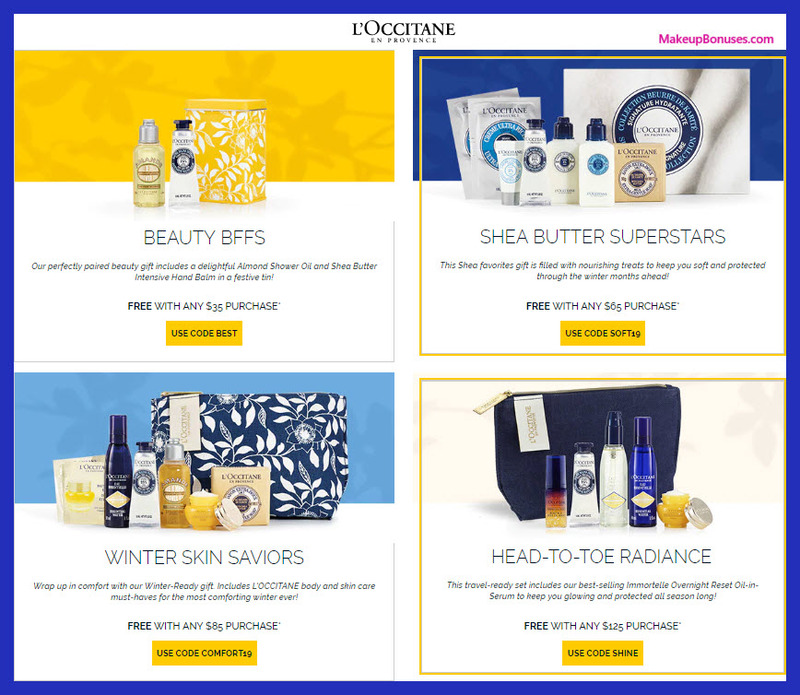 Crabtree & Evelyn offers Free Shipping on purchases of $75 or more. Credo offers Free Shipping on purchases of $50 or more. 1% of all sales donated to Lipstick Angels. deborah lippmann offers Free Shipping on purchases of $35 or more. deborah lippmann offers Free Shipping for deborah lippmann account members. Flower Beauty offers Free Shipping on purchases of $30 or more. Freedom Deodorant offers Free Shipping on all purchases. 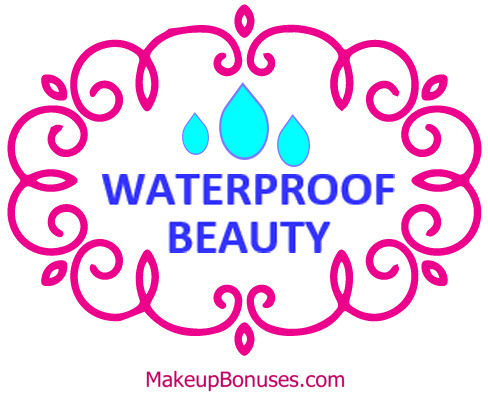 H2O+ Beauty offers Free Shipping on purchases of $50 or more. Juicy Couture offers Free Shipping on all purchases. Kate Somerville offers Free Shipping on all purchases. Kate Somerville offers Free Returns on all purchases. Kevyn Aucoin offers Free Shipping on purchases of $50 or more. LANEIGE offers Free Shipping on purchases of $25 or more. Laura Mercier offers Free Shipping on purchases of $50 or more. Laura Mercier offers Free Returns with $50 order. Lip Smacker offers Free Shipping on purchases of $25 or more. Lovely Skin offers Free Shipping on all purchases. Promotion includes Purity One Step Facial Cleanser, Purity Made Simple Moisturizer Packette, Purity Hydra bounce Eye Gel + more! Macy’s offers Free Shipping on all purchases. Macy’s offers Free Shipping on Beauty purchases. Macy’s offers Free Returns on beauty purchases.Minumum purchase of $99 required to qualify for free shipping with no beauty purchase. Make Beauty offers Free Shipping on purchases of $25 or more. Mario Badescu offers Free Shipping on purchases of $35 or more. Mellow Cosmetics offers Free Shipping on purchases of $40 or more. Milani offers Free Shipping on purchases of $25 or more. Milani offers Free Returns within 30 days of date of purchase. Mio Skincare offers Free Shipping on all purchases. Free shipping available worldwide! Molton Brown offers Free Shipping on all purchases. NeoStrata offers Free Shipping on purchases of $75 or more. Olay offers Free Shipping on all purchases. Pacifica offers Free Shipping on purchases of $50 or more. Peach & Lily offers Free Shipping on purchases of $50 or more. Perricone MD offers Free Shipping on all purchases. PÜR offers Free Shipping on purchases of $40 or more. RealHer offers Free Shipping on purchases of $50 or more. Sahi Cosmetics offers Free Shipping on purchases of $40 or more. Saks Fifth Avenue offers Free Shipping on all purchases. Saks Fifth Avenue offers ShopRunner 2-day Shipping on select items for ShopRunner members. Saks Fifth Avenue offers Free Returns for ShopRunner members. Silk Therapeutics offers Free Shipping on purchases of $30 or more. Skyn Iceland offers Free Shipping on purchases of $35 or more. The Detox Market offers Free Shipping on purchases of $80 or more. This Works offers Free Shipping on all purchases. Too Faced offers Free Shipping on purchases of $50 or more. trèStiQue offers Free Shipping on purchases of $30 or more. trèStiQue offers Free Returns within 14 days of order receipt. Bonus is 5x for Platinum & Diamond members! Urban Outfitters offers Free Shipping on purchases of $50 or more. Vapour Organic Beauty offers Free Shipping on purchases of $75 or more. Wander Beauty offers Free Shipping on purchases of $40 or more. WelleCo offers Free Shipping on purchases of $140 or more. YesStyle offers Free Shipping on purchases of $35 or more. Yves Rocher offers Free Shipping on purchases of $40 or more. Zirh offers Free Shipping on purchases of $60 or more. Great Beauty Gifting Options with Free Upgraded Shipping and More! There is still time to order great beauty gifts online without breaking the bank. Check out these options to save big on your holiday shoppping and still receive it on time! Anthropologie offers Free Shipping for $150 AnthroPerks member orders members. Becca Cosmetics offers Free Shipping for BECCA account holders/ members. BUXOM offers Free Shipping on purchases of $25 or more. Promotion also includes 2 day shipping free! Glytone offers Free Shipping on purchases of $65 or more. 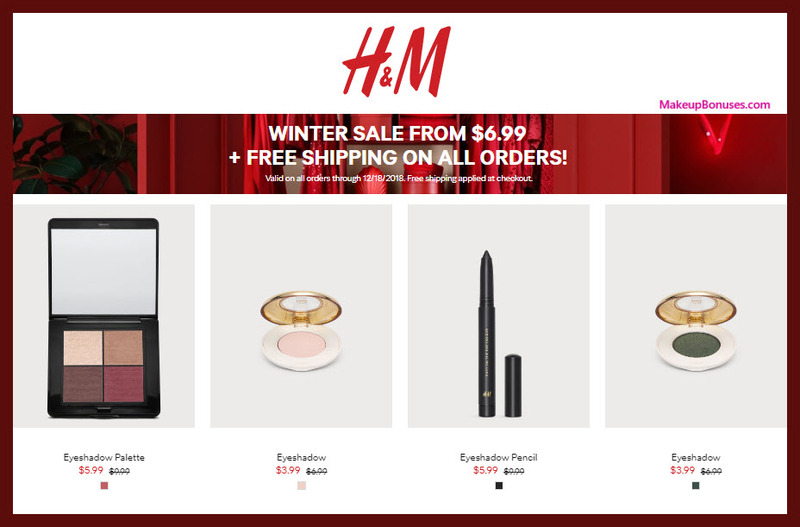 H&M offers Free Shipping on purchases of $40 or more. HSI Professional offers Free Shipping on all purchases. Klorane offers Free Shipping on purchases of $35 or more. Laqa & Co offers Free Shipping on purchases of $30 or more. Laura Geller offers Free Shipping on purchases of $50 or more. Free Shipping on All Holiday Orders. Lime Crime offers Free Shipping on purchases of $50 or more. Puritan’s Pride offers Free Shipping on purchases of $49 or more. René Furterer offers Free Shipping on purchases of $85 or more. Skin and Co Roma offers Free Shipping on purchases of $29 or more. Sonya Dakar offers Free Shipping on purchases of $75 or more. 90+ New Beauty Offers for Green Monday! There are so many stores celebrating #GreenMonday with BEAUTY OFFERS – be sure to take advantage of these great beauty offers while they last! Beauty Brands offers Free Shipping on purchases of $50 or more. Bliss offers Free Shipping on purchases of $50 or more. Coastal Scents offers Free Shipping on purchases of $50 or more. DHC offers Free Shipping on purchases of $85 or more. DHC offers Free Shipping for DHC Hako members ($10 annual fee) members. Giorgio Armani offers Free Shipping on purchases of $75 or more. Giorgio Armani offers Free Returns on Foundation purchases. Jo Malone offers Free Shipping on all purchases. Jo Malone offers Free Returns (engraved items not eligible for exchange or return). Lancôme offers Free Shipping on purchases of $49 or more. Lancôme offers Free Shipping for Auto-Replinish orders. Lancôme offers ShopRunner 2-day Shipping on select items for ShopRunner members. Lancôme offers Free Returns for ShopRunner members AND on foundations. Lather offers Free Shipping on purchases of $60 or more. lilah b. offers Free Shipping on purchases of $65 or more. Promotion also includes plus extra 15% off with code FRIENDS during sale! Milk Makeup offers Free Shipping on all purchases. NaturaBrasil offers Free Shipping on purchases of $50 or more. Nomad Cosmetics offers Free Shipping on purchases of $20 or more. Nomad Cosmetics offers Free Returns on all purchases. OLE HENRIKSEN offers Free Shipping on purchases of $50 or more. OLE HENRIKSEN offers Free Shipping on purchases with code FREESHIPPING. OLE HENRIKSEN offers Free Returns within 60 days (of original purchase date). Patchology offers Free Shipping on purchases of $25 or more. PopSugar offers Free Shipping on purchases of $100 or more. Promotion also includes buy a $100 Gift Card or more and get a free $10 bonus card. Gift Card Sale offer only valid on values of $25 or more. Offer ends 11:59pm EST 12/10/18. (*NOTE: Bonus card will be delivered within 3 business days of close of sale. The Balm offers Free Shipping on all purchases. Vichy offers Free Shipping on purchases of $25 or more. W3LL PEOPLE offers Free Shipping on purchases of $35 or more. Winky Lux offers Free Shipping on purchases of $30 or more. Score big beauty deals at all of these US retailers! 100% Pure offers Free Shipping on purchases of $50 or more. Free shipping on all orders all season long (excluding photo). Andalou Naturals offers Free Shipping on purchases of $50 or more. Josie Maran offers Free Shipping on purchases of $25 or more. Karuna offers Free Shipping on purchases of $30 or more. MAC Cosmetics offers Free Shipping on all purchases. MAC Cosmetics offers Free Returns on all purchases. Ouidad offers Free Shipping on purchases of $50 or more. Quasar MD offers Free Shipping on all purchases. SK-II offers Free Shipping on all purchases. SK-II offers Free Returns on all purchases. 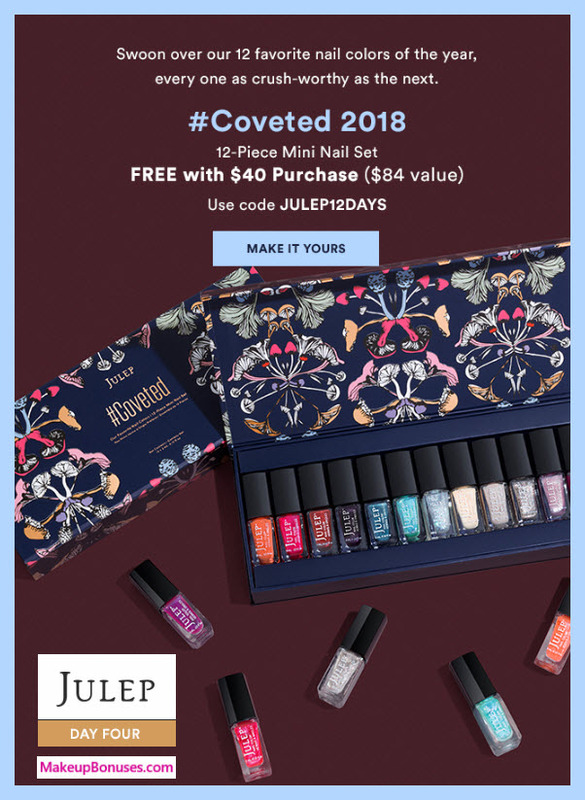 Dozens of Cyber Monday Beauty Sales & Promo Codes! Here is the latest roundup of Cyber Monday offers. Act fast as most of these #CyberMonday offers expire today! 24 Sèvres offers Free Shipping on all purchases. Absolute New York offers Free Shipping on purchases of $50 or more. Amika offers Free Shipping on all purchases. Amika offers Free Returns on all purchases. Avon offers Free Shipping on purchases of $40 or more. Avon offers ShopRunner 2-day Shipping on select items for ShopRunner members ($25 minimum purchase). Avon offers Free Returns for ShopRunner members. Bastide offers Free Shipping on purchases of $75 or more. Bellápierre offers Free Shipping on all purchases. Biossance offers Free Shipping on purchases of $50 or more. Biossance offers Free Returns on all purchases. Black Opal Beauty offers Free Shipping on purchases of $25 or more. Bloomingdale’s offers Free Shipping on purchases of $150 or more. Bloomingdale’s offers Free Shipping on Beauty purchases of $50 or more. Bloomingdale’s offers Free Shipping for Loyallists members. Bloomingdale’s offers Free Returns on all purchases. Bluefly offers Free Shipping on all purchases. Burt’s Bees offers Free Shipping on purchases of $49 or more. Carol’s Daughter offers Free Shipping on purchases of $40 or more. Carol’s Daughter offers Free Shipping for Friends of the Family ($25 annual fee) members. Chantecaille offers Free Shipping on all purchases. Charming Charlie offers Free Shipping on purchases of $50 or more. claire’s offers Free Shipping on purchases of $40 or more. Clē Cosmetics offers Free Shipping on purchases of $50 or more. Color Wow offers Free Shipping on purchases of $30 or more. Cosme-De.com offers Free Shipping on purchases of $40 or more. Decorté offers Free Shipping on all purchases. Dermstore offers Free Shipping on all purchases. Dermstore offers Free Returns on all purchases. EO offers Free Shipping on purchases of $50 or more. Exuviance offers Free Shipping on purchases of $75 or more. Foxybae offers Free Shipping on purchases of $65 or more. Gerard Cosmetics offers Free Shipping on purchases of $35 or more. Glossybox offers Free Shipping on all purchases. hanalei company offers Free Shipping on purchases of $40 or more. hanalei company offers Free Returns on all purchases. Harmon Face Values offers Free Shipping on purchases of $50 or more. IBY Beauty offers Free Shipping on purchases of $35 or more. Illamasqua offers Free Shipping on purchases of $55 or more. Look Fantastic offers Free Shipping on purchases of $25 or more. LXMI offers Free Shipping on purchases of $40 or more. Moroccanoil offers Free Shipping on all purchases. Natural Healthy Concepts offers Free Shipping on all purchases. Naturopathica offers Free Shipping on purchases of $75 or more. Free Shipping on All Orders through 12/31/2018. NUDESTIX offers Free Shipping on purchases of $49 or more. NuFace offers Free Shipping on purchases of $75 or more. Oribe offers Free Shipping on purchases of $100 or more. Promotion excludes Kiehls, Natura Bisse, salon services, super specials, gift cards and clearance. Pretty Vulgar offers Free Shipping on purchases of $40 or more. Pureology offers Free Shipping on purchases of $50 or more. Riley Rose offers Free Shipping on purchases of $40 or more. Rituals offers Free Shipping on purchases of $40 or more. Stowaway Cosmetics offers Free Shipping on purchases of $30 or more. Studio Gear offers Free Shipping on purchases of $50 or more. Sulwhasoo offers Free Shipping on all purchases. T3 offers Free Shipping on purchases of $50 or more. Target offers Free Shipping on purchases of $35 or more. Target offers Free Shipping for REDcard members when using REDcard members. Target offers Free Returns on all purchases. Tarte offers Free Shipping on purchases of $40 or more. Tarte offers Free Returns for customers with a registered tarte.com account. Tatcha offers Free Shipping on all purchases. Tatcha offers Free Returns on all purchases. Thrive Causemetics offers Free Shipping on purchases of $35 or more. V76 offers Free Shipping on purchases of $50 or more. VIOLET GREY offers Free Shipping on purchases of $50 or more. Happy Thanksgiving Beauty Discounts at Dozens of Stores! ASOS offers Free Shipping on purchases of $40 or more. ASOS offers Free Shipping for Premier 2-day Delivery ($19/1 year) members. Charlotte Tilbury offers Free Shipping on all purchases. Charlotte Tilbury offers Free Returns on all purchases. Chella offers Free Shipping on purchases of $25 or more. Cleopatra’s Choice offers Free Shipping on purchases of $49 or more. 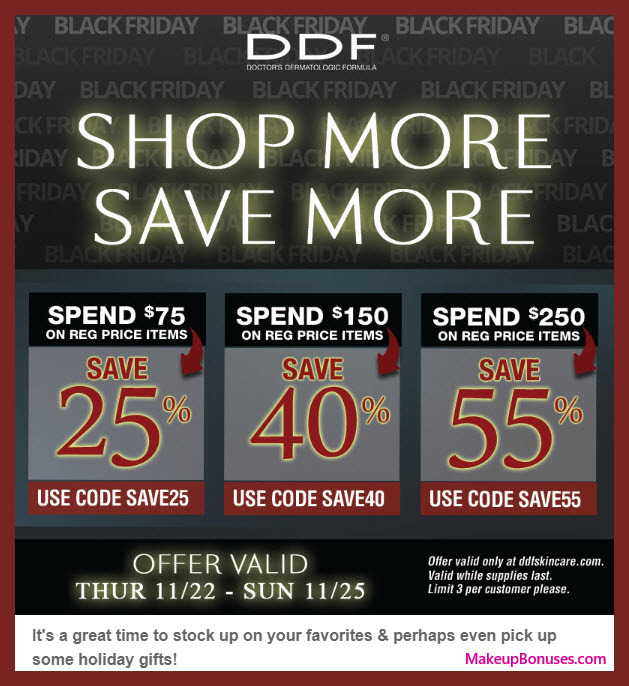 DDF offers Free Shipping on purchases of $50 or more. Promotion also includes CYBER500 at checkout when they spend $500 or more will receive one 15ml Hydra-Therapy Refresh Infusion and one Full Size Phormula 3-9 Eye Repair. Erno Laszlo offers Free Shipping on all purchases. GlowBiotics MD offers Free Shipping on purchases of $49 or more. Hampton Sun offers Free Shipping on purchases of $50 or more. ILIA Beauty offers Free Shipping on purchases of $75 or more. Jelly Pong Pong offers Free Shipping on purchases of $50 or more. Kat Von D Beauty offers Free Shipping on purchases of $50 or more. Kat Von D Beauty offers Free Returns within 60 days. Kohl’s offers Free Shipping on purchases of $75 or more. La Roche-Posay offers Free Shipping for $45 Minimum Purchase members. Luxie Beauty offers Free Shipping on purchases of $50 or more. NARS Cosmetics offers Free Shipping on purchases of $50 or more. NARS Cosmetics offers Free Returns within 30 days. Origins offers Free Shipping on purchases of $30 or more. Origins offers Free Returns on all purchases. PÉRSONA offers Free Shipping on purchases of $30 or more. Promotion also includes discount is larger (up to 50% off) earlier in the day! The BrowGal offers Free Shipping on purchases of $50 or more. Trish McEvoy offers Free Shipping on purchases of $50 or more. Promotion also includes discount is additional % off of sale prices! ZENMED offers Free Shipping on purchases of $75 or more.